I just attended the media preview on behalf of Disney Family for the upcoming Napa Rose Disney Princess Breakfast Adventures (which will begin March 30th). I know so many people have been excited to learn more about this character dining experience, since it will be the only Disney Princess character dining available at Disneyland Resort since Ariel’s Grotto closing last year. So follow me and Amelia on our breakfast adventure, to get a peek at what to expect and everything you need to know! What Happens On the Disney Princess Breakfast Adventures? When you arrive and check-in, you are given a choice to pick between two autograph books and pens for your child to keep and get the princesses’ autographs throughout the breakfast. You then immediately get to meet the first princess! I am not sure if these rotate out day by day or hour by hour, but the princess we were greeted with was Rapunzel. In the lounge area where you wait to be taken to your table by your adventure guide, there is a Tangled Tic-Tac-Toe, live music playing, and waiters with trays of sparkling wine. You also have the opportunity to sign your name in the adventure book! Once seated, you’re given a menu where you can select fun non-alcoholic or alcoholic beverages, themed to different princesses at an additional cost. Coffee, tea, juices, and a glass of champagne is included in the price of your breakfast. You are also brought a bread basket, filled with a scone, cinnamon danish, and lemon monkey bread. For the vegan option, you are brought a vegan almond croissant. As you wait for your first course to begin, the princesses will begin to come around to each table one-by-one to sign autographs, take pictures, and give hugs! Throughout the dining, you will have four princesses come around to your table (ours were Belle, Aurora, Tiana, and Jasmine). For our first course we had the vegetarian option, which included a sandwich with cream cheese, a chia seed pudding parfait, a beignet, and a caramelized banana with strawberry jam. If you select the regular option, you get the caramelized banana, beignet, parfait, a lobster roll, and your sandwich is topped with turkey. For the vegan option, you are brought the parfait but served without granola, the caramelized banana without a crepe, a veggie sandwich, and a slice of toast topped with avocado and cucumber. For the second course, you head to the buffet, which also has great vegetarian and vegan options! They have Mickey waffles, as well as vegan Mickey waffles made upon request. They also have lots of fresh fruit, asparagus and tomatoes, scrambled eggs, impossible burgers served as sliders or as sausage, and a tofu scramble if you’re vegan! They also bring a basket of fries to your table which were crisped to perfection! For the third and final course, you are brought a dessert tray! I requested a dessert tray that was half vegan, so the one pictured below had the bottom layer of the regularly served desserts, and the top layer was vegan. The second tray pictured was the all-vegan dessert tray. My favorite was the Pocahontas inspired peanut butter chocolate mousse! After dessert, your adventure guide brings you to the Napa Rose patio to have a story time with a princess (ours was Mulan, some people had a story time with Belle). We also did some activities with Pocahontas afterward. The last part of the adventure was us going into a room where we could have individual photos with Ariel taken by a Photopass photographer (the princess in the room with Photopass can change, it’s not always Ariel). They give you a card with all the photos, which are complimentary included in the price of the experience. As you leave, you receive a drawstring backpack that says Napa Rose Disney Princess Breakfast Adventures, with a box of Disney Princess chocolates, and a Princess crown necklace! To sum things up, the experience way exceeded my expectations. I couldn’t believe we met eight princesses total, got an autograph book, a necklace, had a three course meal with beverages included, and had interactive experiences even after the meal! It took a total of about 2 1/2 hours, making it a memorable experienced that wasn’t rushed. Souvenir gift from the adventure! And there you have it! 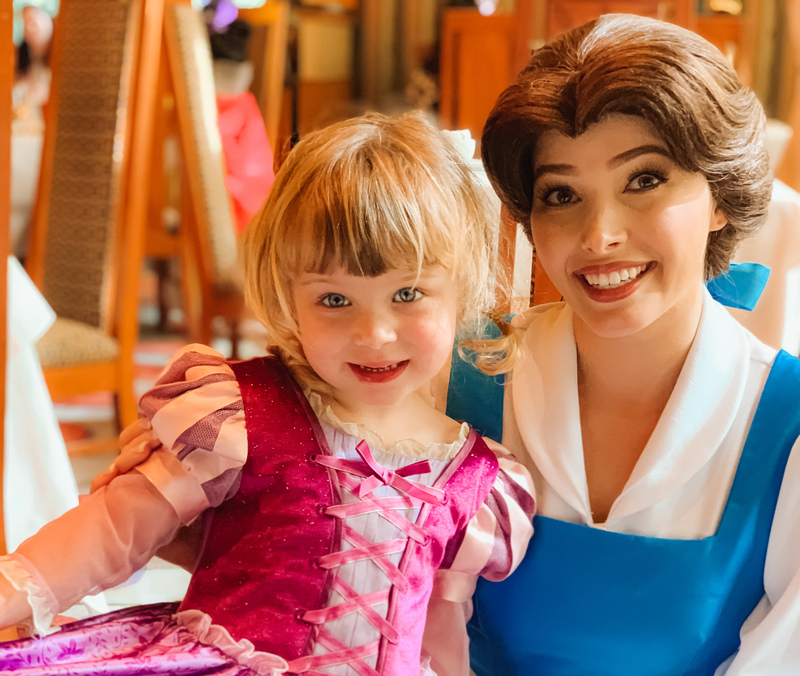 Everything you need to know about the Napa Rose Disney Princess Breakfast Adventures! We went along with a lot of our friends, and made for the most epic playdate ever. It would also be super fun for a bridal shower, baby shower, or a brunch with friends! The experience is offered Thursday through Monday 8am-12pm, bookings can be made here. To read my experience of going to the Napa Rose Disney Princess Breakfast Adventures without kids, visit here.